The Wildcat Midway is one of the smaller areas of the park, yet it packs quite a punch. There are only five rides here, but three of them are roller coasters. We get to the Wildcat Midway by bearing left as we leave the Main Midway. As we enter the Wildcat Midway, one of Cedar Point's two Dodgem rides comes into view on the left. This Dodgem is Cedar Point's oldest remaining Dodgem ride, and is also the park's largest. 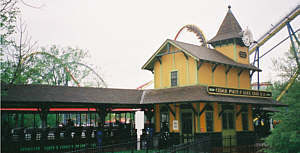 When Top Thrill Dragster was built, the Dodgem ride in that location was moved to Michigan's Adventure in Muskegon, but the antique-styled cars from that ride were moved to this Dodgem. The other Dodgem is the Krazy Kars, located in Kiddy Kingdom. The Wildcat is Cedar Point's most portable roller coaster, now resting in its third location. 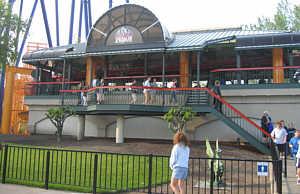 The ride was built in 1970 at the site currently occupied by the Cedar Point Extreme Sports Stadium. In 1980, the Wildcat was moved to the site currently occupied by Disaster Transport. In 1985, Wildcat scampered off to its present location. Looking at the ride, it appears that, with enough people, the ride could be relocated in one piece. For that reason, I maintain that the ride was moved by having the 3000+ employees gather around the ride. The boss shouted, "Everybody, LIFT!" The employees then walked the ride down the midway to its current location, not even disrupting the riders on board. Of course, if you believe that story, I've got a roller coaster to sell you! Naturally, the riders had to get off, first. Employees have jokingly referred to the Wildcat as the only ride where everyone has to get out and push. On the ride, you may notice some purple boards. Those boards are acting as windbreakers. 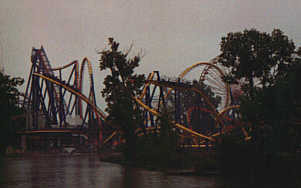 When the ride was first moved to this location, the wind had a much larger impact than in the ride's previous two locations. Gusts of wind would actually stop the cars at the locations now protected by the boards. Since the boards were installed, wind has not been a problem, but the joke remains. It's a bit hard to see here, but if you look at the top picture, peering through the right side of the ride, you can just make out a red building with a grey roof. That building is the Cedars Employee Hotel, used as a dormitory for male employees. The building was constructed in 1915 as a guest hotel, but it wasn't very popular compared to the fabulous Hotel Breakers. As a result, it was turned into employee housing. This housing has a community shower located in the middle of the building. Prior to 1985, the story is told by some of the older housing personnel that the showers were not enclosed. 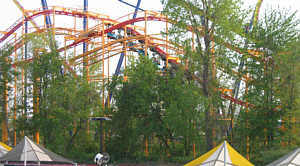 This condition did not pose any problems until the Wildcat was moved to its current site, where it was discovered that the shower area could be seen from the ride. Wow, get a ride, and a peep show! OK, honesty time: I understand that a new shower area was built for 1985, but I cannot confirm that the old showers were outdoors. I can confirm that I lived in the Cedars, with the Wildcat right outside my window. It was very convenient -- the ride acted as my alarm clock! As for the Cedars, don't be surprised if it is torn down in the near future to make way for a new ride. The building is just a cardboard box with a door and a window, so it won't be a great loss! More employee housing is being built off of the peninsula, and The Cedars sits on some prime real estate, so it is a good location for future park expansion. However, the building is also considered to be of some historical significance, hence it may remain standing for many years to come. 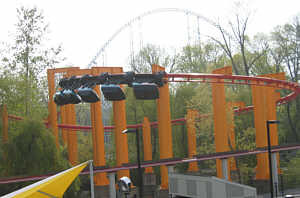 Across the midway from the Wildcat is Iron Dragon, Cedar Point's suspended roller coaster. Built in 1987, Iron Dragon isn't as exciting as the inverted Raptor, but it helped pave the way for the current generation of suspended and inverted coasters. 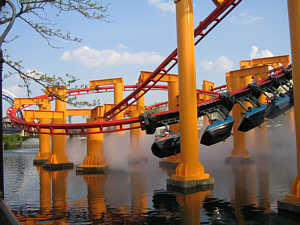 One feature of Iron Dragon that Raptor does not have is the swinging buckets, which is the primary difference between suspended and inverted classes of coasters. As you race along the Iron Dragon track, your car swings about freely. Here's a tip: you can get a rather good pull on your stomach if you sit in the back seat! Here is a true Iron Dragon story that is just a bit eerie. This story can be confirmed. Look out, Rod Serling, 'cause here it comes! In February of 1987, while the Iron Dragon was still being built, I had a very strange dream. I was walking along the midway into the Wildcat area, when I saw a new red and blue suspended roller coaster. Now, having worked in the park in 1986, I knew that Cedar Point was building a suspended roller coaster in the Wildcat area, but I had never before seen a suspended coaster, and had not seen drawings of this coaster, nor did I know the planned color scheme. In the dream, I saw the train racing along the track, swinging back and forth. I stopped to talk to Dave Hensley, the man who hired me. As we talked, we watched the train going by. The lack of crowds indicated that the park was probably not open for the season -- the ride was being tested. While standing there talking to Dave, the train suddenly dove down and hit the cement. At that point, I woke up instantly. That day, I called Tania, a good friend of mine, and told her of my dream. 1987 was to be her first summer working at The Point. She arranged to arrive before the park opened for the season to help prepare the food stands. A few days prior to opening, she gave me a call. It seems that, while test riding, the bottom of the front of one of the Iron Dragon trains hit a concrete foundation of one of the support posts. Apparently, my dream came true! Tania indicated that the accident happened the first time test riders were put on the ride. The extra weight of the riders pulled the train down, thereby allowing it to come in contact with the cement. Fortunately, while the train hit hard enough to crack the train's underside, no one was injured. 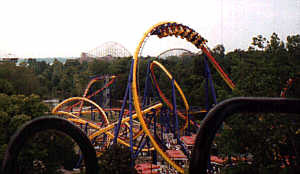 The problem was fixed by slowing down the speed of the ride, pending the installation of a permanent solution during the 1997-98 winter. Incidentally, this dream was not my first "prediction" dream, but it was the only one that I told to someone else prior to the actual event taking place. What can I say, you've entered, "The Guesser Zone!" Just to reiterate, the Iron Dragon story is absolutely true. I know that I stated that I didn't let facts stand in the way of a good story, but, in this instance, the story tells the facts exactly as they occurred. Prior to this story, my friends thought my line of "Fool the Psychic" was just a line! 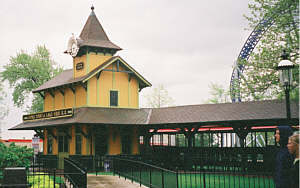 Continuing down the midway, we see the Funway Station of the Cedar Point and Lake Erie Railroad. There's nothing quite like the sights, sounds, and smells of authentic steam engines! These restored antique small-gauge trains will take you on a leisurely ride to Frontiertown, where you can exit, or return to the Funway Station. A souvenir book from 1965 provides a brief history of two of the CP and LE engines. The Albert was built in 1911 by Davenport Locomotive Works, where it transported sugar cane for the St. John plantation near St. Martinsville, Louisiana. Albert Levert was the plantation owner. The Maud L was built in 1902 by Baldwin Locomotive Works of Philadelphia, Pennsylvania. This locomotive was also used on Louisiana sugar plantations. The plantation owner named the locomotive after a woman he loved, but who married someone else, saying, "I'll still have my little Maud." Looking to the right, we find yet another Cedar Point roller coaster, Mantis. 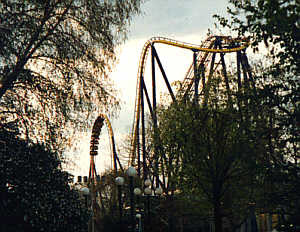 At the time of construction in 1996, Mantis was the tallest, fastest and steepest stand-up roller coaster in the world. What is a stand-up roller coaster? You don't get to sit down for this one! Just how much can you stand? 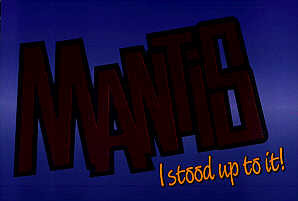 Mantis will take you upside-down four times, all while you remain on your feet. Try to get into the front seat, er, standing area on Mantis, as the sensation is truly remarkable. The back seat also presents some excitement, but make sure your fillings are in tight, 'cause the back is just a bit rough! Personally, I prefer Raptor, Millennium Force, Top Thrill Dragster, and Magnum over Mantis, but I still feel this ride is a winner, as the 12th Cedar Point roller coaster provides a unique riding experience. When a park has this many coasters, it can be tough to make sure that they all provide an exciting ride, different from the other park rides. Mantis does succeed in filling this role, once again proving that Cedar Point truly is America's Roller Coast. While riding Mantis, be sure to keep smiling -- you're picture is being taken! The photo on the left was taken during my fifth time challenging Mantis. See if you can manage a better pose while on the ride! The picture on the right was taken from the Giant Wheel, Cedar Point's Ferris wheel. With all of those twists and turns, it's easier to find Waldo than to trace the path of the track! There was a little bit of confusion regarding the name for Mantis. Near the end of 1995, Cedar Point sent out the postcard on the right, announcing the new stand-up roller coaster to open in 1996. 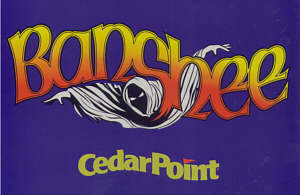 So, what happened to the Banshee name? The rumor says that someone connected with upper management received a dictionary for Christmas that year. Upon looking up Banshee, she discovered that a Banshee is a female Irish spirit who's wailing signifies a forthcoming death in the family. Hmmm: Roller coaster -- forthcoming death. Probably not a good combination to link into the minds of potential riders! So, the Powers That Be went back to the drawing board and hatched the name Mantis. 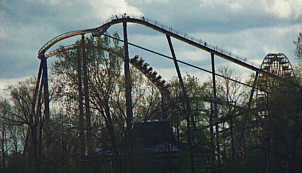 Mantis, like Raptor, is a coaster where you need to be as tall as Michael Jordan to ride. Well, OK, it's just 54 inches, but it matches the tallest height requirement in the park. Wait a minute... Didn't there used to be another ride here? From 1972 all the way through the 1999 season, Wildcat Midway was also the turf of the Giant Wheel. Prior to the 2000 season, Giant Wheel was pushed out by a far bigger ride. Don't panic, however. Giant Wheel hasn't left Cedar Point, it just went skittering off into a safer corner! It will be encountered on the Twister Midway portion of the tour. The Wildcat Midway is better suited for the adults. However, Iron Dragon's height requirement is only 46 inches, compared to the usual 48, so five and six year olds are frequently tall enough to ride it. It's a good way to get the youngsters ready for the bigger thrills, which will just be a year or two away! Naturally, children are also invited to ride the Cedar Point & Lake Erie Railroad. There are more shows on the Wildcat Midway! When you first entered this midway, you may have noticed a large brown and beige building on the left. That's the Cedar Point Good Time Theatre. It used to be the Cedar Point Cinema, which was an IMAX movie theater. Now, however, Snoopy has moved in, and, being the cool beagle he is, he brought some ice with him! Snoopy Rocks On Ice first opened in 2002. And, of course, the beagle is back for 2008, this time with Snoopy's Big Bow Wow! This ice show with the Peanuts gang runs from June 21 through September 1 (except Wednesdays). You probably also spotted that large screen in front of the Cedar Point and Lake Erie Railroad train station, and the steel boxes pointing at it. 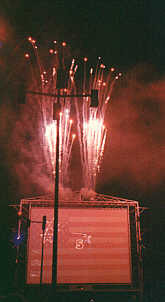 The Wildcat Midway is the site for Hot Summer Lights, a laser, light, video, pyrotechnics, and sound show installed in 1995 to celebrate 125 Cedar Point seasons. Catch the fireworks, lasers, and rockin' tunes every night at 10, running from May 30 through August 17. 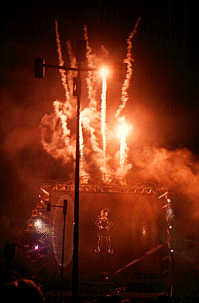 In 2006, Cedar Point added a new special effect called "FireWater," claiming to be the first and only amusement park to feature this new effect in a nightly show. Arrive somewhat early for the show, or you might find yourself behind a light post, rather like in the pictures to the right. If you're looking to hit some rides just before the show, beware. Because of the type of show, and low lighting conditions, Cedar Point initiates an early closing for Wildcat, Iron Dragon, Dodgem, and the CP&LE Railroad. Those rides reopen when the park has an 11 PM closing time, which covers Saturday nights in June, July, and most of August. Games are scarce on the Wildcat Midway. Actually, they are more than scarce, they are non-existent. There used to be one game on this midway, namely the Wildcat Guessing Game, located (oddly enough) next to the Wildcat. This location was my scale for the 1988 season. Remember that story about my dorm room overlooking the Wildcat? Well, it proved to be very convenient. I could look out my window, see if my crew had everything ready on time, and, if they didn't, call the scale from my room. I don't know that they ever figured out from where I was calling! I was really quite sorry to see Wildcat Scale go, as it was home to another recent ghost story. During that 1988 season, strange things were happening at the Wildcat Scale. Our ladder mysteriously started to break apart. Our Public Address system acted very flaky. How flaky? When two people were at the scale, it always seemed to work fine. When one person was alone at the location, they'd be talking normally, then a <pop> would be heard. Suddenly, the volume of the PA shot through the roof, where the slightest whisper into the microphone would cause some very annoying feedback. When the second person returned, the volume would be adjusted down. The next time only one person would be at the scale, another <pop> would occur. Now, the person would have to yell into the microphone to be heard at all! OK, these events were not enough to convince us that there was a ghost, but the summer was still young. I always used a joke indicating that if people didn't start playing, I'd start singing. "And when I start singing, everybody starts running, 'cause I've got a voice that can bring rain. The last time I started singing, they had to build an ark! I started humming a few years ago, and Thunder Canyon was formed! A couple years later, I whistled, and, you guessed it, Soak City popped up" Well, I couldn't really use that line in 1988 because Ohio was experiencing a drought. Instead, I modified the joke to indicate that when I started singing, the Earth started moving. "The last time I started singing, they called it the Great San Francisco Earthquake." Well, one day, no one was playing, so I issued the threat. They continued to not play, so I sang a bit. My crew even witnessed the fact that, as soon as I started singing, some of the trim at the floor on the post behind me split in half and fell off. OK, it still wasn't enough to convince us that there was a ghost, especially since I do have a rather bad singing voice. Here was the real stinger: We had a sign that hung from the ceiling by way of interlocking cup hooks. Cup hooks are those things that look like Captain Hook's hook. Well, on windy days, it was not uncommon for the sign to get blown around, causing a hook to pull out of it. That's exactly what happened, leaving the hook dangling from the other hook in the ceiling. After we pulled down the sign (now hanging from one hook instead of two), I jumped up and batted at the dangling hook, knocking it into the "inflate" display over the prize door. We had a bunch of inflatable baseballs and pillows attached to the prize door by rubber bands. Anyway, my coworker and I couldn't find the hook. It didn't drop out of the inflates, and we couldn't see it stuck in them. No big deal, we figured we would get it at the end of the day when we took down the inflates. When taking them down, we still didn't find the hook. Over the next two weeks, the inflate display was reworked a couple of times. I always liked to keep my displays looking fresh. Well, exactly two weeks after I batted the hook into the inflates, the same coworker and I were standing in the same spots. I was giving him instructions and pointing to the display, when the cup hook suddenly dropped from the inflates. There was absolutely no way it could have been sitting there for two weeks. At that point, we were convinced we had a ghost. Being the leader of the scale, I had the honor of naming the ghost. The ghost was named Lumpy, utilizing the nickname of Steve "Lumpy" Rutherford. Lumpy, a nine-year Cedar Point veteran, was the guesser who trained me. 1988 was his first year not returning to the park, after having worked the 1987 season at the Wildcat Guessing Game. Hmmm, quite the array of coincidences! Far from being scared of our ghost, we took him in true Guesser fashion -- we used him to make money. One guesser would stand in the back room, while the other was on the microphone. On cue, the guesser in the back would make the prize door move, or would write a note on a piece of paper and drop it through a slot in the display, all the time blaming these activities on our ghost, Lumpy. Most kids loved it, as did their parents. One child, however, screamed her lungs out and ran around to grab her mother's legs! The mother and I could hardly stop laughing long enough to make the guess! Food choices are limited on the Wildcat Midway, but you don't have to go hungry! Added in 1999, Coasters Drive-In, a 50's diner, serves great burgers and fries. You'll also find some milk shakes and malts. When I ordered a milk shake, the cashier informed me that they were, "Yummy." The enthusiasm was overwhelming. However, I did find that I really liked the chocolate shake. For my opinion of the shakes, I'll agree with the cashier: Yummy. 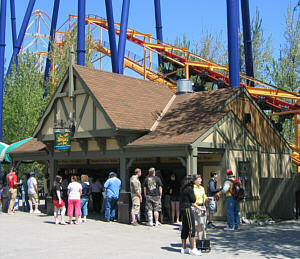 Just beyond the Iron Dragon is Dragon's Inn, serving standard amusement park food. 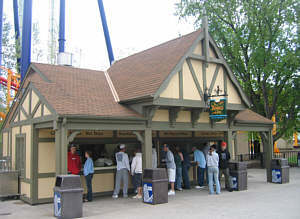 Admittedly, I'm surprised that Cedar Point didn't decide to run with the theme and call this eatery the Dragon's Lair. Naturally, such remarkably great ideas are precisely why Cedar Point should hire me as a full time employee! I think my title would be something to the effect of "Doofus In Charge Of Silly Names That We Will Proceed To Ignore Due To Such Limiting Factors As Good Taste." Hmmm, maybe that's why they don't hire me -- that title would be too long to fit on a business card. There are not many places at Cedar Point where you can't find a gift shop, but the Wildcat Midway happens to be one such place. You'll just have to save your shopping desires for the Frontier Trail!